Your Brain On Sugars – Not So Sweet. - Is Disease Hereditary? Your Brain On Sugars – Not So Sweet. “Added” or “free” sugar is the sugar in your diet that is NOT from fruits and vegetables but instead is found in processed foods and drinks as well as sugar products (eg, sugar, honey, syrup, agave, corn syrup, molasses, etc). It has been associated with extra weight, obesity, diabetes, rheumatoid arthritis, and dental caries…to name only a few. Obesity, high blood pressure, and coronary heart disease have been found to be DIRECTLY related to increased consumption of “added sugar” and sugar-sweetened beverages in a dose-response manner; meaning, the more sugar you consume, the higher your risk of these diseases and vice versa. Additionally, obesity and being overweight is now a known risk factor for neurodegenerative disease (ie, dementia, Parkinson’s, Alzheimer’s) and unhealthy brain activity…even if you are otherwise healthy. Findings in studies related to increased weight and/or body mass index have included reduced brain metabolism, decreased amount of gray matter (! ), and reduced blood flow to the area of the brain (prefrontal cortex) that is associated with executive function (getting things done), reasoning, and attention. So if you chronically consume too much “added” sugar in your diet and are overweight, you may find yourself with non-uniform brain activity like the photo below. 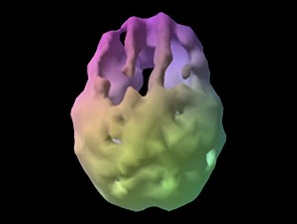 This could be your brain on sugars. 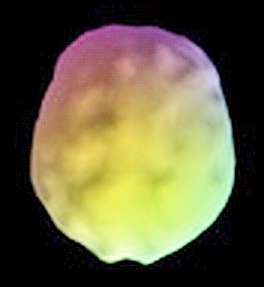 These are SPECT scans: a NORMAL brain (uniform) and the brain of a person with DEMENTIA (non-uniform). Photos courtesy of Amen Clinics website; www.amenclinics.com. How Much “Added” Sugar is OK? Well, the American Heart Association (AHA) recommends that you should not eat more than 6 teaspoons (25 grams; 100 calories) each day as a woman and 9 teaspoons (37.5 grams; 150 calories) if you are a man. The 2015 Dietary Guidelines for the US and the World Health Organization advise that “added sugars” should be less than 10% of your total daily calorie intake and preferably less than 5%. The latter is more in line with the AHA recommendations. Interestingly, the 5% recommendation is based on an observation that resulted from a “natural” experiment that occurred in 1946. Compared to before World War II, the consumption of sugar dropped to 0.5 mg per day (from 4 mg) because sugar was not readily available. It was noted that this dramatic drop in sugar consumption was accompanied by a drop in dental caries, as well. Because no reported evidence has yet to link disease or adverse health effects to sugars consumed from eating whole fresh vegetables and fruits, the recommendations above do not include sugars intrinsic to these real foods. But Stevia® and Truvia® come from leaves of the stevia plant, it’s natural…right? Molasses is supposed to be rich in iron. Raspadura is less processed and supposedly has more minerals. The MINISCULE amount of any nutrients that may, or may not, be present in the little bit of added sugar that you may, but really shouldn’t, eat is of such little consequence that I don’t think it matters one hill of beans (or sugar, grin). Especially, if the foundation of your daily diet is about 75% vegetables with some lean protein and a bit of fruit. As it should be. Oh, and btw, the “natural” sweetener from the stevia plant is highly processed and concentrated…just because something comes from a plant doesn’t automatically imply it’s good for you and can be consumed without discretion. The entire profession of pharmacy (and pharmaceuticals), afterall, is the science of extracting “natural” compounds from plants…where consumption without discretion, as with your diet, can cause serious adverse effects and even be fatal. So the next time you want something a little sweet, eat a handful of berries or other fruit. Even better, slice up a fresh peach or apple and sauté it slowly until is soft then top with some chopped walnuts! And here’s a cool trick: to cut the bitterness of coffee or tea, use a little lemon juice or a lemon slice. When I lived in Australia, I’d go pluck a leaf off my lemon myrtle tree for my coffee and voila! Bye-bye bitter. Hu Y, Costenbader KH, Gao X, Al-Daabil M, Sparks JA, Solomon DH, Hu FB, Karlson EW, Lu B. Sugar-sweetened soda consumption and risk of developing rheumatoid arthritis in women. Am J Clin Nutr. 2014;100(3):959-67. Huang BX, Reilly KH, Li S, Zheng R, Barrio-Lopez MT, Martinez-Gonzalez MA, Zhou D. Sugar-sweetened beverages and risk of hypertension and CVD: a dose-response meta-analysis. Br J Nutr. 2015;113(5):709-717. USDA. Scientific Report of the 2015 Dietary Guidelines Advisory Committee. Accessed May 30, 2015 at http://www.health.gov/dietaryguidelines/2015-scientific-report/. Willeumier, KC, Taylor DV, Amen DG. Elevated BMI is associated with decreased blood flow in the prefrontal cortex using SPECT imaging in healthy adults. Obesity. 2011;19:1095-1097. World Health Organization. Guideline: sugars intake for adults and children. Accessed May 30, 2015 at http://www.who.int/mediacentre/news/releases/2015/sugar-guideline/en/.